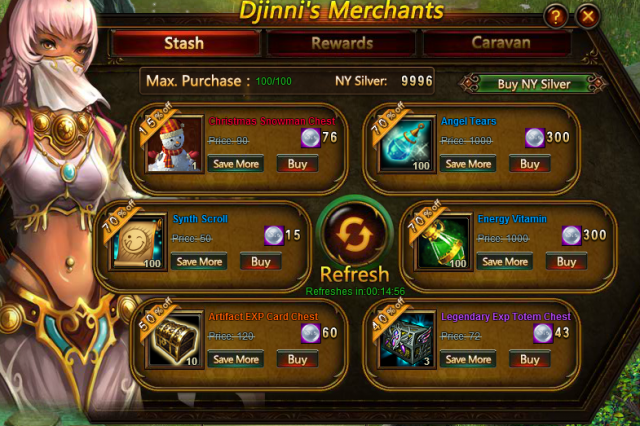 Along with incoming new year, we bring you a different Djinni's Merchant, in which you can use NY Silver to but the items you want. Go to the Hot events for more NY Silver and get what you want here! - Click the “Refresh” button for a chance to buy different discounted items. 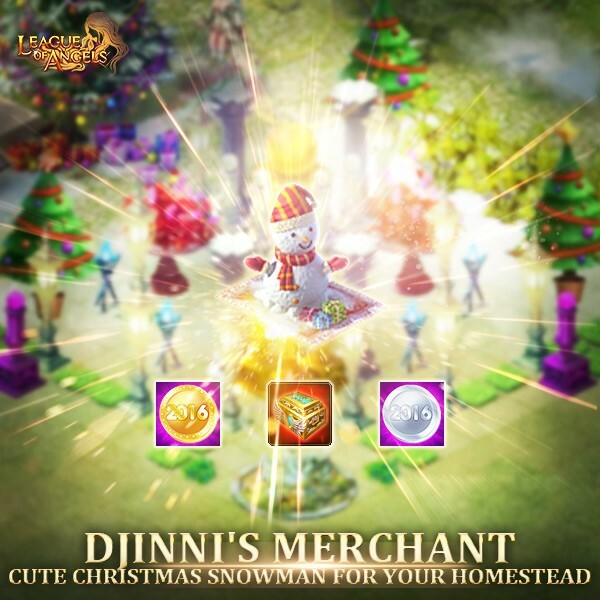 The commodities include Christmas Snowman, Mystery Box, in this box you can get NY Silver and NY Gold an other hot items. The Conqueror, Fiery Turkey, Flaming Rocket, Medieval Armor, Lvl. 6 Cherubstone, Lvl. 1 Glorystone Chest, Lvl. 8 Superior Gem Chest, Lvl. 8 Common Gem Chest, Lvl. 7 Superior Gem Chest, Lvl. 7 Common Gem Chest, Energy Vitamin, Legendary Exp Totem Chest, Rare Exp Totem Chest, Purgatory Soul, Grotto Heart, Energy Card, Enchanted Ore, Element Scroll, Timeskip Scroll, Blessed Stone, Soulstone, Seraph's Stone, Gem Enhancement Stone, Element Crystal, Aegis Shard, Refining Stone, Runestone, Angel Tears, Gold, and many more. Description:Recharge and consume diamonds to buy NY Silver with a huge discount! 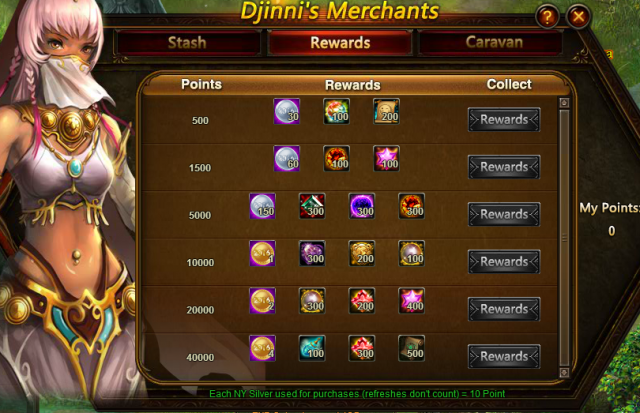 More exciting events are coming up through Jan. 1 to Jan. 3 (server time). Check them out in the in-game Hot Events menu now! LoA_Wheel of Luck: More Gems Await You! LoA_Champion Showdown: Are You Ready? LoA_Let's Enjoy XMAS Warming Up! LoA_Loralei’s Wardrobe: Dress up Santa Clothes!